We didn’t use any of it though, we preferred it by itself. It was light and airy and good. It had just the right amount of sweetness and went down easy. All of us enjoyed this a lot. 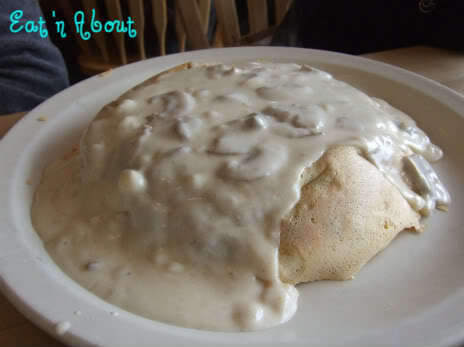 This was one of The Original Pancake House’s specialties. Then was this monstrous thing here called the Mushroom Omelette. Doesn’t look like it huh? According to them, it’s a five-egg omelette that’s oven baked. If it was a busy day we would’ve had to wait about 30 minutes for this. And you know what else guys? This omelette comes with TWO sides. TWO. The portioning in the States is unreal. I don’t think they have such thing as portion-control. There’s a choice of homefries, pancakes, or something else…I don’t remember! 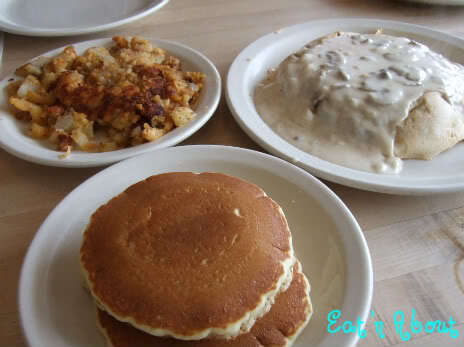 I picked homefries and pancakes. The homefries weren’t that good. Dry, lukewarm, and too much potato! The pancakes were nice though, fluffy and soft. Very fresh. Don’t know if you can see clearly but that’s what the omelette looks like cut up. 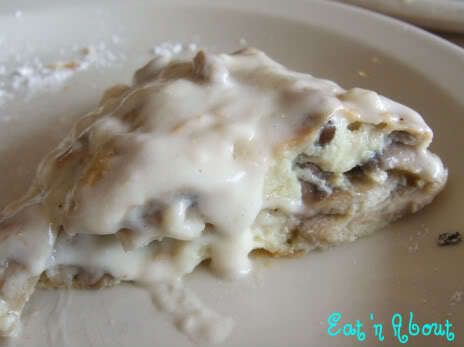 The Mushroom Omelette is “filled with fresh mushrooms and topped with a rich mushroom sherry sauce”. To be honest the mushroom and sauce part were quite good, but the omelette part wasn’t. It just didn’t taste like an egg/omelette product. It was more cakey. If I didn’t know it was supposed to be an omelette, I would’ve thought it’s a pancake with mushrooms. Perhaps too much flour was mixed in with the egg. 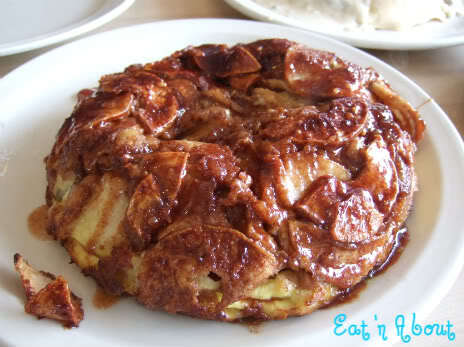 Last item was their famous Apple Pancake. 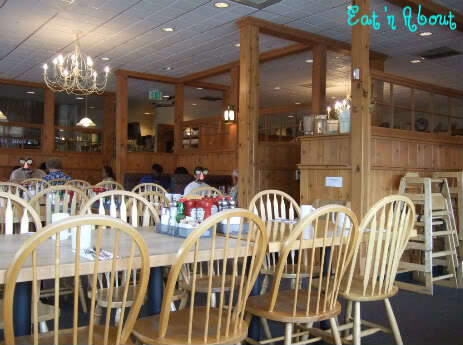 Apparently this place is always packed during the weekend, and when you’re waiting, they’ll bring out their specialty Apple Pancakes to serve you while you wait. 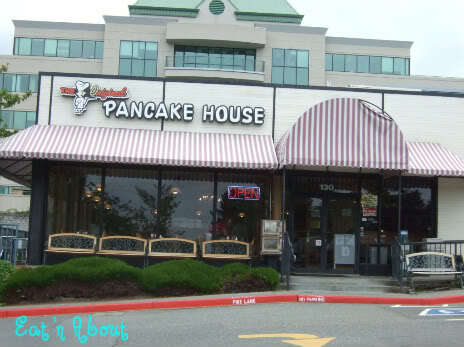 So I thought, what if some people just come for the wait, fill up on the free pancake, then leave??? Anyways, today it wasn’t that good either. It was very sweet obviously, but I think the pancake batter failed to rise while cooking. It was very dense and not like how I like my pancakes. Some apple slices were too hard. Overall not enjoyable. Even though my aunt agrees, she says that my cousin just raves about this, so perhaps it was an off day today. Maybe the weekends are better. 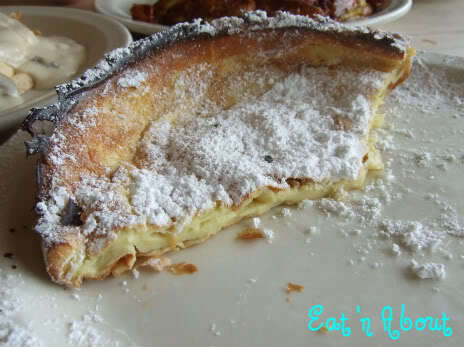 My favorite out of the three is definitely the Dutch Baby. I think portion size in the states is only THIS ridiculous at chain and “family” restaurants. I don’t find it a problem at many other places. Actually, I find most Chinese places in Vancouver to be ludicrous with portion size. When I go with my husband, I often get the evil eye when I order small enough for us to actually finish a meal. Otherwise, I end up with more leftovers than I want to deal with. (And perhaps this is the point). Still, I hope you had about 12 folks at your table to finish up all that pancakey goodness! (And perhaps some insulin, just to be on the safe side). 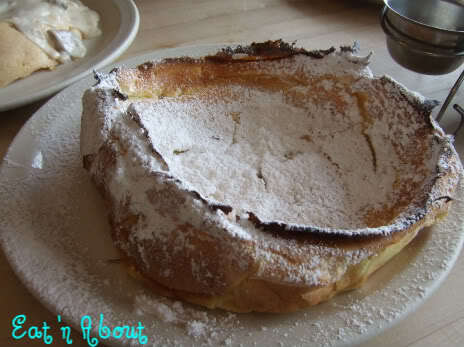 The Dutch Baby looks like a souffle gone wrong. I’ve wanted to check this place out ever since I heard about it on the Food Network. It seems like a place that you need to visit with more than one person or you’ll have a stomache afterwards. Oh definitely, and make sure you order with the intent to share. You can’t finish one thing by yourself. The mushroom omelette was DELISH!! I want to go back for all their yummy food~ and i agree, the sides were HUGE!! Just the mushroom omelette order is more than enough for 2 ppls!! Did your mushroom omelette actually taste like an egg product?